Vintage watches by Van Cleef & Arpels are not at all common and typically, we might have perhaps only one or two in stock. However, without exception, they are of outstanding quality and typically of striking art deco design that makes them memorable to us long after we’ve sent them to their new owners. Discussing the matter here before writing this article, we can clearly remember almost every vintage Van Cleep & Arpels watch that has passed through out hands over the last decade, which is really quite remarkable and very telling about the character of these items. Along with Cartier and Tiffany & Co, Van Cleef & Arpels should be regarded as one of the three finest jewellery houses of the last hundred years. Founded in 1898, it was a more recent concern than its two competitors and came about as a consequence of the marital union of two individuals from experienced diamond cutting families. Alfred Van Cleef had been an established cutter in Paris before meeting Estelle Arpels, daughter of Leon Arpels who had enjoyed considerable success during his time in the same field. As a newcomer without a track record, Van Cleef & Arpels couldn’t hope to compete on a head to head basis with grand jewellery houses that had supplied the European aristocracy for many decades. 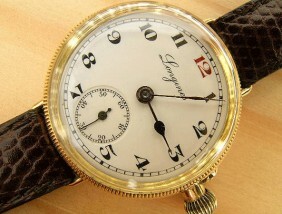 In a very similar way to Rolex, which wrong footed the traditional Swiss horological houses by embracing the wristwatch at a time when pocket watches were still the norm, Van Cleef & Arpels made its name by offering a more modern, cleaner look that was a marked departure from the Victorian styles that still dominated the industry at that point. From 1906, when Van Cleef & Arpels opened its shop in central Paris at 22 Place de Vendome, almost next door to its rival Cartier, the firm became a design powerhouse that caught the imagination of the wealthy high society set. The Gothas and their heirs were regular customers as were various Eastern European Dukes, Spanish Marquises and members of the English nobility, including the Duke of Windsor who purchased a number of pieces for his wife Wallace Simpson. A strong market for the brand was also India and some of its most fabulous creations were shipped to Maharajas there. The archives at Van Cleef & Arpels reveal that Indian princes bought regularly from the house, having a taste for both stock items and those manufactured by special commission. Having been fruitful since the early 1920s, the relationship between Van Cleef & Arpels and the top tier of Indian society strengthened even further after 1948 when Jacques Arpels, head of the firm’s Paris branch, was invited to stay with the Maharaja of Baroda as a personal friend. In 2009, London’s V & A museum held an extremely interesting exhibition, “The Splendour of India’s Royal Courts”, in which numerous Van Cleef & Arpels and Cartier pieces were on public display. It is important to appreciate that Van Cleef & Arpels only ever embraced the ultra luxury market and never offered more utilitarian models. In common with Cartier, it did not supply the rugged so-called “trench watches” for use by officers serving among the mud and bullets of World War I, but eschewed these in favour of the jewelled creations that were so fashionable on the cocktail circuit with the social elite at the time. Probably in excess of seventy percent of the vintage watches by Van Cleef & Arpels that we’ve owned over the last twenty years have featured jewel set cases, typically with a strong art deco appearance. In common with Cartier, Asprey and Dunhill, Van Cleef & Arpels was never a manufacturer of movements. Instead, it purchased these from a variety of third party houses that were capable of creating movements to its exacting standards. Van Cleef & Arpels was essentially a very innovative aesthetic think tank rather than a watch maker, but by keeping a careful eye on quality and choosing to purchase only from the very best suppliers, the end result was some of the most appealing vintage watches of the last century. Very well preserved, totally original vintage watches by Van Cleef & Arpels are relatively pricey, largely because they were only sold in small quantities in the first instance. Finding worthwhile examples today isn’t an easy task and we reject most of those offered to us on the basis of either over-restoration or dubious authenticity. Like Cartier, the Van Cleef & Arpels name is inextricably associated with mental images of glamorous living in the jazz age 1920s and ‘30s, and this upmarket, old money aura unquestionably has an effect on values today. Having said this, despite the price premium involved in buying into the brand, the reputation that Van Cleef & Arpels has for superb quality and exclusivity will ensure that these watches continue to appreciate steadily in worth in the future, exactly as they have over the last twenty five years since the concept of the vintage wristwatch as a collectible emerged in the mid-1980s. Along with those by Cartier and Hermes, pre-Word War II antique art deco watches by Van Cleef & Arpels must be some of the most beautiful vintage timepieces ever made for female use and it is almost impossible to imagine any sophisticated lady who wouldn’t be delighted to receive one of these coveted items as a gift.